In the the 1960s, a Stanford psychologist ran an experiment to study children's self-control. It's called the marshmallow test. And it's super simple. Kids ages 3 to 5 choose a treat — an Oreo cookie, a pretzel stick or a marshmallow. Then researchers give the child brief instructions: You can eat the treat now, but if you can wait for me to return, you'll get two treats. The researchers leave the room. And the child just has to sit there staring at a marshmallow — and deciding whether to exert self-control or to dig in. Psychologists have performed the experiment many times. In general, fewer than half the kids "pass" the test. 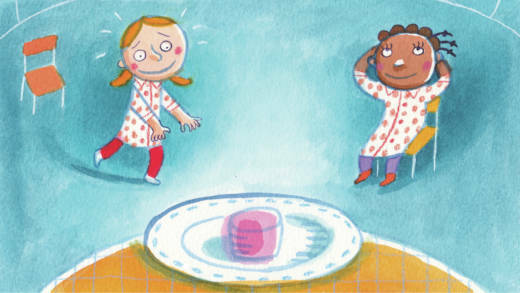 Most kids can't delay gratification: They gobble up the marshmallow. The researchers followed these kids for decades and found that those who did wait were more likely to have better SAT scores and better jobs later on in life, the researchers reported. Now for the first time, there's a study reporting on what happens when psychologists give the marshmallow test to kids outside Western culture, specifically 4-year-old children from the ethnic group Nso in Cameroon. "The Nso are a community who live off subsistence farming, mainly corn and beans," says Bettina Lamm, a psychologist at the Universitat Osnabruck, who led the study. "Most of the children live in mud brick houses without water and electricity. They have to work a lot to take care of younger siblings and help their parents on the farm." Guess what? These kids rocked the marshmallow test. "The difference was huge," Lamm says. "The Cameroonian kids really behave very differently, and they were able to wait much better." Lamm and her colleagues ran the experiment on nearly 200 Cameroonian and German kids. The Cameroonian kids were offered a puff-puff — a little doughnut popular there. Compared to German children in the experiment, the Cameroonian kids waited, on average, twice as long for the second treat. And way more Cameroonian kids — nearly 70 percent — waited the full 10 minutes to snag the second marshmallow. Only about 30 percent of the German kids could hold out, Lamm and her team reported in the journal Child Development in early June. Lamm and colleagues watched the kids closely during the experiment and tracked their behavior. The German kids showed way more emotions during the waiting period, she says, especially negative emotions. They whined more, cried more and squirmed more in their seats. "They were really fighting the waiting period — playing with their fingers, talking to themselves — trying any distraction they can to manage to wait," she says. "In contrast, many of the Cameroonian kids simply sat quietly and waited," Lamm says. "Ten percent of them even fell asleep." It's almost like the kids were meditating. Lamm says they don't know exactly why the Cameroonian kids were so good at the marshmallow test. Kid behaviors are complicated and sophisticated. But one reason may be the Nso parenting style, which is completely different than Western parenting. "Nso children are required very early to control their emotions, especially negative emotions," Lamm says. "Moms tell their children that they don't expect them to cry and that they really want them to learn to control their emotions." This parenting style starts very early — when children are newborns. "The moms breast-feed their babies before they start to cry so they don't need to express any negative emotion," Lamm says. "This emotion is already regulated before it's expressed." Western moms spend a lot of time looking at their babies for signals to figure out what their babies need. The Nso moms don't do this. "They believe they — the moms — know what is good for a baby, and they do what is good for a baby," Lamm says. "They don't need to look for signals from the baby." As the children get older, this parenting style continues. "Kids are really expected to learn to control their needs and not ask for their desires or wishes," she says. These moms expect obedience and respect. And the kids are good at adapting to situations where they don't get what they might want, where they have to wait. "So they learn self-control," Lamm says. "Maybe it's a different type of self-control than Western kids learn. But it's very effective." But self-control might not be the whole picture, says Celeste Kidd, a neuroscientist at the University of Rochester. A few years ago, she and her colleagues found evidence that the marshmallow test doesn't involve just self-control. It also measures how much a child trusts his environment — how much the child trusts that the researcher is really going to return with the second marshmallow. "What also matters is kids' expectations about whether waiting will be worth it or not," Kidd says. Because if you think about it, if the child doesn't believe that second marshmallow is actually going to arrive, then it makes sense to eat the first one. "We have evidence that kids take under consideration the statistical nature of what has happened in the past," Kidd says. "So for example, if a child is living in an environment where there's a lot of uncertainty and instability, then they may think that waiting isn't likely to pay off even though they have the ability to delay gratification." Nso parents are quite strict and consistent with their discipline. So, Kidd says, perhaps this consistent parenting boosts the kids' trust in adults — that when the person in charge says they're going to bring a second treat, they likely will.